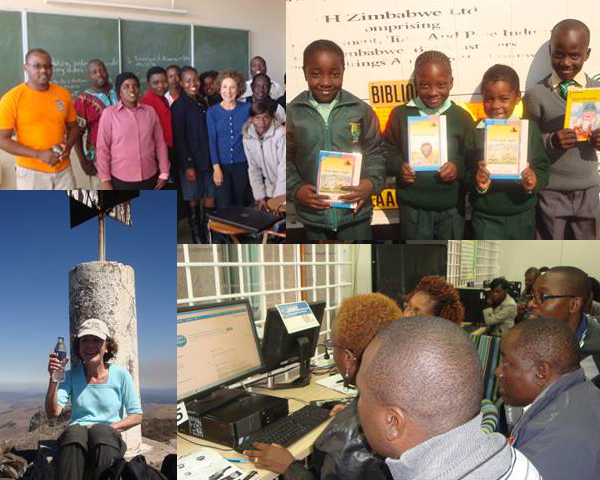 (Clockwise from top left) Lee Pasackow with her class of librarians, a day with the public library book mobile, teaching MBAs at the US embassy, and Lee on top of Mt. Zangani. Question: You had a Fulbright grant this summer in Zimbabwe – why did you select this country? Lee: I am a “host family” for the Fulbright Humphrey Fellows that study at Rollins for a year. I’ve had two Fellows from Zimbabwe. Anele Ndebele, who is now a Member of Parliament, arranged for the Department of Library & Information Science at the National University of Science and Technology (NUST) in Bulawayo to be my host. Question: What was the highlight of your six-week visit? Lee: Certainly the Information Literacy Skills course, “Train the Trainer,” I taught to librarians who worked at elementary schools, universities and technical colleges. They were enthusiastic and eager learners. I shared with them exercises that my Woodruff colleagues had prepared using Google forms. We created interactive exercises based on learner-centered learning and designed learning outcomes. They were very curious to learn more about ACRL’s new frames. Question: Are you still in touch with them? Lee: Yes, I send the group articles – particularly related to how to evaluate web sites. They are most interested in Open Source. Just this week I alerted them to CORA, the online, open-access platform of librarian and faculty contributed assignments, lesson plans, and activities that engage with information literacy concepts and practices, from Loyola Marymount University. If anyone in LITS can recommend additional Open Source materials – journals, reference sources, software, etc – I would be very grateful. Question: Was the majority of your time spent at NUST? Lee: Not really. I visited libraries in Bulawayo. One day I went with the Public Library Book Mobile to visit four elementary schools. Despite the meager offerings, the students were excited to check out books. I attended the Zimbabwe International Book Fair in Harare. Due to the challenging economic times, it was scaled back but still they had presenters from Kenya and Zambia. I co-taught a library orientation class to incoming MBAs with the Business Librarian. The NUST classrooms were unavailable for our class in Harare so luckily the U.S. Embassy complied with my request to use their Information Center for our class. Question: Did you get any time to travel around the country? Lee: Former Fulbrighters and their friends and families took good care of me! They wouldn’t let me leave the country without seeing Victoria Falls, Hwange National Park, Great Zimbabwe and Matobo National Park. After my grant I went to the Eastern Highlands, on the border of Mozambique. It was easy to hire a guide to hike in the mountains. I visited Africa University in Mutare. We have an Emory student whose parents teach at this university. Lee: I encourage LITS folks to check Fulbright.org for grant opportunities. Our organization has much to contribute to less well endowed educational institutions. Despite the fact that the government has no money, the Zimbabwean people continue to study, teach civil governance, engage in the political process and strive to improve their communities. Extended families are all involved in the education of the young generation. I hope I will have the opportunity to return in the not so distant future. This entry was posted in Staff Bytes and tagged Library. Bookmark the permalink. Post a comment or leave a trackback: Trackback URL.